CleanGoal Corporation plans on distributing a rare antiaging product called Regenurex. Few people have heard of it, but the antioxidant astaxanthin offers so many benefits that it won’t stay unknown very long. This algae-based antioxidant has been shown to be a very effective treatment for all types of tendon, joint and muscle pain, arthritis and tennis elbow. It’s also a great nutritional supplement for beautiful skin, and it offers unique and powerful benefits for your eyesight as well. Astaxanthin has become the favorite supplement of endurance athletes for its ability to help your body generate energy and reduce lactic acid buildup that depletes you of your stamina. Astaxanthin is a potent anti-inflammatory and pain reliever, blocking different chemicals in your body that make you scream “ouch!” More than that, astaxanthin reduces the inflammatory compounds that drive many chronic diseases. Even though it’s 100 percent natural, astaxanthin works like some prescription analgesics, but without the risk of addiction, GI bleeds or heartburn. 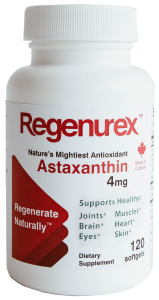 More specifically, astaxanthin blocks COX 2 enzymes just like Celebrex, the blockbuster drug prescribed for osteoarthritis, Rheumatoid arthritis, acute pain and monthly dysmenorrhea. In fact, astaxanthin works well with Celebrex — it would be wise to take both together if you want to and if your doctor approves of astaxanthin. Natural astaxanthin not only affects the COX 2 pathway, it suppresses serum levels of nitric oxide, interleukin 1B, prostaglandin E2, C Reactive Protein (CRP) and TNF-alpha (tumor necrosis factor alpha), and all of this has been proven. Natural astaxanthin was shown to reduce CRP by more than 20 percent in only eight weeks; there is not a prescription drug I know of that does that! Even the American Heart Association claims CRP is a key indicator of heart disease. Astaxanthin provides excellent recovery from exercise. Just like salmon making the heroic upstream swim, astaxanthin can help athletes do their best. Pure natural astaxanthin is indicated for recovery of muscles, better endurance, enhanced strength and improved energy levels. Remember the famous song, “I can see clearly now, the rain is gone…” Well, I associate that song with astaxanthin. It has the unique ability to cross through a barrier and reach your retina. Well-designed clinical trials have shown that astaxanthin helps diabetic retinopathy, macular degeneration, eye strain and fatigue and seeing in fine detail. There are well-designed positive human clinical trials supporting eye health. Natural astaxanthin is exceptionally powerful in singlet-oxygen quenching. A 2007 study analyzed several popular antioxidants and their antioxidant power. This study found astaxanthin was 6,000 times stronger than vitamin C, 800 times stronger than CoQ10, 550 times stronger than green tea catechins and 75 times stronger than alpha lipoic acid. Astaxanthin has been shown to protect the body’s largest organ. The studies are clear and consistent and show excellent results for helping with skin moisture levels, smoothness, elasticity, fine wrinkles, and spots or freckles.